A Leading Animal Communication Specialist and Pet Problem Solving Specialist Can Help You and Your Animal in SO Many Ways! Are you looking for an animal communication expert? Do want help solving the problems you’re experiencing with your pet? I’m Val Heart, a leading animal communicator, speaker, bestselling author, consultant. I’ve been called The Real Life Dr Doolittle, Animal Communicator to the Stars and am an empathic animal behaviorist, My specialty is solving problems with dogs, cats and horses. Internationally recognized as a pet psychic, I’m also a master healer for you AND your animals. I can take you to the place you want you want to be with your animal because I bridge the gap between you. wasted money, energy and time. Your pet’s viewpoint is uniquely theirs, and until we truly understand them, we can’t truly know how to best help them. Val could wave a magic wand during your session, what would you like to have happen as a result of working with her? What would be different in your life? How could your relationships with your animals or your own life change for the better? If you chose to work with Val and received benefits like these, what would that be worth to you? Please be sure and review other Testimonials so you can get an understanding of how Val works and what she’s all about, and to see how the results of her work have benefited other animal lovers like yourself. [box background=”#FFFFCC”] Grand Prix Dream Horse Mystery Lameness Turned Around In ONE Session! 4 Fundamental Results You’re Guaranteed to Receive When You Choose to Work With Me! Every penny you invest in working with Val is safely backed by her reliable, famous “100% no quibble, no hassle guarantee”. No one else in this field offers anything even close. That’s how confident she is that she can help you. Val doesn’t offer just animal communication services – that’s because she’s not just another animal communicator. Talking with your animals is just the best place to start resolving problems. What she knows you really want and need is help RESOLVING the issues! She can help you with healing, improving performance in competition, resolve training and behavior issues, and much much more. Val promises that if you don’t agree that by the end of your session you have these 4 Fundamental Results, then she’ll refund your money out of her own pocket. You have her word on it. When you work with Val, you gain access to her successful proprietary methods and a comprehensive service. No other animal communicator, trainer, intuitive, healer, behaviorist or pet psychic offers 4 Fundamental Results – 100% Guaranteed, or your money back. 1) An individually tailored Action Management Plan to help you lower your trainer and vet bills, avoid further damaged property costs, and to spend your money, energy and time focusing on getting the results you want. 4) Better overall balance in Body, Mind & Spirit for you AND your animal – because when you are more balanced, healthy and happy, your animal can be too. 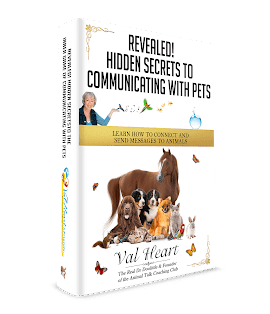 Bonus: You’ll also receive instruction and coaching on how to communicate with animals yourself, helping you develop a lifetime skill you can use with your animals now… and for the rest of your life. Val’s goal is to empower her clients and students to follow your own intuitive knowing, to be fully present and consciously aware, and to know how to connect at the heart and mind level for yourself. Do You Know How The Human Animal BodyMind Connection Between You and Your Animal Is Involved? Val is the foremost authority on the complexities and intricacies of the Human Animal BodyMind Connection, sometimes known as Group Consciousness. You and your animal are connected energetically. That means that what may appear to be an issue with them may actually be an issue with their caretakers. Without recognizing this critically important dynamic and including it in your session, you won’t be able to achieve the best result possible. Val is trained in various BodyMind Assessment therapies which are state of the art in healthcare consulting today, and are designed to assist with all manner of chronic pain or illness. Her work is especially suited for anyone who is feeling stuck in their life and wants to move forward. The Healing Journey isn’t for sissies! It sometimes requires facing deep wounded and ugly spots within ourselves, making new choices and discoveries about who we are, changing our lifestyle, rebuilding damaged cells, organs, systems… The BodyTalk System of state of the art healing techniques accelerates this process greatly, addressing the multiple causal factors in a dynamic and powerful way, opening us to personal growth at very deep levels. So you really have to be committed and ready for this, willing to go through the process and do what’s needed to achieve change in every level of your Being. Exploring deeper into the puzzle, sorting out why we behave and feel the way we do, and bringing peace and closure to wounds, emotional – mental – physical — that’s what it’s all about. If you or your animals are not healing quickly and easily, then there is something blocking you. Val is trained to discover and resolve that, and with your help and commitment to the process, expect to see things improve in your life — sometimes dramatically and quickly, other times more slowly and surely.